I as a reader first saw this book by M.J. Higgy in a Facebook event, the author was auctioning it off to help the victims of the Storm Sandy Hurricane that struck the northeastern coast in the earlier winter of 2012, and I like the cover, and downloaded it into my kindle. Sometimes life throws us curve balls and as a reader I was looking for something to distract my mind and thought it been a while since I read a children's book. I opened my kindle and picked Bombay Bear. This book has an author and artistic touch to it and uplifts the spiritual and awakens the inner childhood wonderment of readers of all ages. When I first open the cover to the back, I was pleasurably surprised by the beautiful colorful artwork about Bombay Bear. The story is about an orphaned bear that is controlled by an evil performer to dance for alms. The little bear was performing to bring money to his master, the evil man, but he was not bringing enough in for the begging bowl. After a while the performer is tired and desires to travel to a new location and set up a new act of the dancing bear performance to increase his wealth. There is an India tale mixed into this story, a short but powerful narrative about good and bad, light and dark and karma, he sees a way to increase his riches but at what risk? . As a reader I do not want to spoil the brief but entertaining tale. As a mother and if grandmother I would recommended this delightful treat of an ebook or paperback to my children and others for it has valuable morals in it and explains that everyone's actions will bring about good or bad consequences. Karma is alive and it is a gift not to be played with. The only flaw is the story is too short to sit with children and relished over the meanings of the lessons woven into the plot. It is a starter and this author should continue to bring books like this alive as the worlds' children need knowledge and adults to explain morals and though good story telling it is easier to teach which choices bring about which consequences. This author seems to understand this niche. Highly recommend readers, parents and loved ones to preview the author's present and future publications. 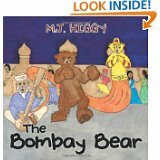 Goggle Author M.J. Higgy and the book, Bombay Bear. The artwork alone is worth the investment, as well as the gem of a story to share with others.